Welcome to this edition of The Demand Creator Minute Video Series. In this edition, I address an issue that we see companies struggle with everyday - effectively entering new opportunities. While the very way customers go about making decisions has fundamentally changed, the typical approach for most B2B salespeople hasn't. Historically, the focus of account entry was to identify the single most leverage contact point. You may choose the focus based upon the prospect's title, authority, standing or various other criteria. But the job was to get to the "point of power" and leverage your presence from there. The problem is that companies are becoming consensus based on the decision/procurement processes. It's no longer enough to leverage that "point of power," and, as The Challenger Study from Sales Executive Council (SEC), highlights you may not even be able to access the role without first building concensus within the buyer's organization. When we work with clients, or when we're implementing an inside sales approach for our clients, our goal is no longer to find that single point of power. Instead, we look to identify at least three points of entry and our goal is to work all three points in parralel fashion to build the value of what we are addressing. We're often entering at easier points in the organization, because we connect to the people who live with the problem. By building a broad base within our prospect's organization we get to the truth faster, and can address obstacles more easily. We are able to save tremendous amounts of time, frustration and resources that are typically spent on the backend of the sales process. As I'm fond of saying, the key to shortening the sales cycle is to slow down the sales process. Another important difference is the mindset one takes when beginning the process. If your focus is on "making the sale," your success will be limited. Getting the sales process started effectively often occurs with people who either don't have the authority to buy (so if you're "selling" they'll feel there is no reason to talk to you) or don't feel the timing is right. Identify areas of concern or dissatisfaction. Your prospect may be consciously aware of the dissatisfaction or unaware. It doesn't matter. Whatever you do, don't seize that dissatisfaction when it's presented (that's old school selling), instead file it away for future use. 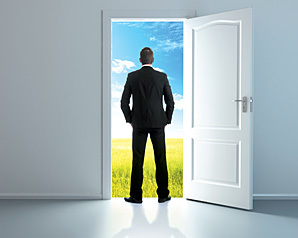 Identify untapped areas of opportunity. Identify conflicts between the various role players. Oftentimes, one of the greatest advantages a seller can bring to a prospect is the ability to see how different people are approaching organization initiatives in manners that conflict. Your ability to point this out, and show how you can address it can make you indespensible to your prospect. When you're clear on those three items, and you've got the material you need to present a strong business case you can then move into your sales process.